The What: Epson has announced a new line of portable projectors, the PowerLite 2000-Series. The series features nine projectors with up to 5,500 lumens, designed for business meetings, large boardrooms, lecture halls, classrooms, and houses of worship. The What Else: The PowerLite 2000-Series leverages HDMI connectivity to easily project digital content, including video and audio, from the latest laptops, Blu-ray Discs, DVDs, and other media players. Utilizing the USB port, the PowerLite 2000-Series can display documents and images from a USB drive stored as PDF, JPEG, BMP, GIF, or PNG files without having to connect to a PC, ideal for boardrooms and small-business projection needs. In addition, leveraging a wireless LAN module, the PowerLite 2000-Series projectors offer security features such as WEP, WPA-PSK, WPA-EAP, and WPA2-EAP wireless encryption to help prevent information leakage in an enterprise environment. The series also features Faroudja DCDi Cinema video enhancement technology, delivering higher image quality without introducing artifacts. In addition, the Digital Imaging and Communications in Medicine (DICOM) Simulation Mode provides the ability to reproduce images with an advanced grayscale level that simulates DICOM Part 14, ideal for viewing grayscale medical images, such as X-rays, for training and educational environments. Wireless screen mirroring with Miracast allows PowerLite 2000-Series users to stream full HD movies, videos, photos, and music from a smartphone, tablet, laptop, or PC directly to the projector. Miracast wirelessly mirrors and streams content from Android mobile devices or Windows PCs to the projector. The flagship models—PowerLite 2265U and PowerLite 2165W—include HDBaseT connectivity for ease of installation, in addition to support for Multi-PC projection, which allows up to four individual PC screens to be displayed simultaneously over the network, with up to 32 connected to the same projector. The projectors include Screen Fit, an auto-sensing feature that adjusts the image size to fit within a frame, with the push of a button. 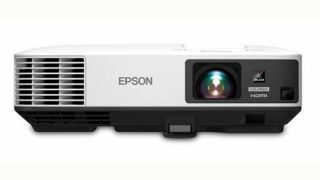 The PowerLite 2265U and PowerLite 2165W projectors can be used with the Epson iProjection App to display content from iOS or Android mobile devices with wireless or network capabilities. In addition, the projectors’ included software allows for remote monitoring and control of Epson networked projectors, and the line is also compatible with Crestron Room View. The Bottom Line: Designed for ease of use, the PowerLite 2000-Series includes up to 5,500 lumens of color brightness and 5,500 lumens of white brightness, in addition to full HD 1080p support and comes equipped with built-in enterprise-level Wi-Fi security, and features a full interface for multiple connections and installation flexibility. The PowerLite 2000-Series will be available in January 2017 through national resellers and direct on Epson.com.